Cocaine is a powerfully addictive stimulant. Cocaine can be injected, smoked, sniffed or snorted. People take cocaine because of the euphoric effects it creates; it heightens experiences and increases energy. However, this is only the initial effect, and a few hours after having taken cocaine, the person is likely to begin feeling depressed, anxious, agitated and paranoid, hence why people decide to take more and the cocaine addiction begins. How do I recognise Cocaine addiction in myself? How do I recognise Cocaine addiction in others? 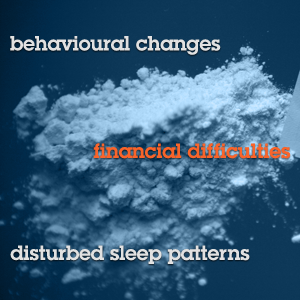 There are many behavioural changes that can be indicative of cocaine or other drug addictions. These changes include disturbed sleep patterns, associating with a new circle of friends, a change in finances and lack of interest in other hobbies and pursuits. What treatment is there for Cocaine addiction? Whilst there is no official medicated detox programme for cocaine, a detox will aim to make sure that the person is as comfortable as physically possible when withdrawing from Cocaine. This will include help with sleeping, anxiety and any other symptoms that can occur when Cocaine leaves the system. The most important aspect of Cocaine addiction treatment is the psychological support; it is important to understand the triggers and reasons behind any addiction in order to deal with it. Both physical and psychological support are best provided in the supportive environment of a residential rehabilitation programme.